Item7 - Victor Adrian in an Airplane. Item8 - Victor Adrian with Ernie Friesen. Item9 - Victor Adrian retirement meal. Item13 - Victor Adrian with Trever Godard. Item14 - Victor Adrian at a graduation. Item15 - Victor Adrian in a meeting. 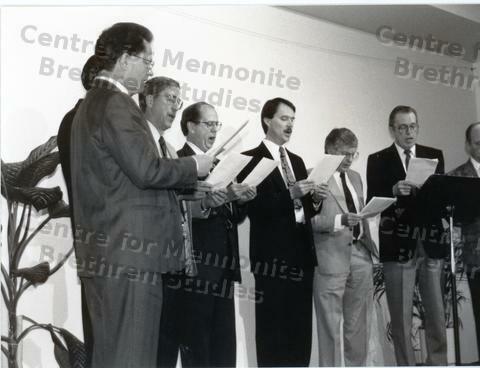 This photo is of a Men's Group singing at Victor Adrian's retirement service. The music group consists of the following: (L-R) Jake Thielman, Ike Bergen, Harold Ens, Clarence Hiebert, James Pankratz, David A. Dyck, John Wall, and Elmer Martens.